The UK's No.1 dance and urban music brand Pure returns with Pure Garage Rewind: it's the very best of old skool garage. It's the anticipated return of the original and best-selling Garage series of all time with over two-million units sold since the first Pure Garage album was released at the end of 2000. Pure Garage Rewind is the definitive Garage classics collection, packed massive hits and anthems from the biggest names in the scene with 63 tracks over three CDs. Look out for all your old skool favorites and remixes from: Craig David, Artful Dodger, Daniel Bedingfield, Tina Moore, Sweet Female Attitude, DJ Luck & MC Neat, Oxide & Neutrino, So Solid Crew, The Streets, Shola Ama, Double 99, MJ Cole, Azzido Da Bass, and many more. The album is packed full of the authentic anthems and chart hits, with five no. 1s: Pied Piper & The Master Of Ceremonies' "Do You Really Like It-, Daniel Bedingfield's "Gotta Get Thru This", Craig David's "Fill Me In", All Saints's "Never Ever (Booker T Remix)", Oxide & Neutrino's "Bound 4 Da Reload", and another five that should have been (they all peaked at no. 2): Artful Dodger featuring Craig David "Re-Rewind", Sweet Female Attitude's "Flowers", Artful Dodger's "Movin' Too Fast", Wiley's "Wearing My Rolex", T2's "Heartbroken". Plus classic underground tracks not normally heard on compilations: X-Presidents "Diamond Rings '96", Baffled's "Going On", and Distant Soundz' "Time After Time". Pure Garage Rewind is the essential triple-CD, 60-track classic Garage collection for 2019, and beyond. CD digipack has a premium finish, with deluxe gold foil embossed text. Also features Sunship, K -Ci & JoJo, Club Asylum, Mis-Teeq, Ed Case, Shelley Nelson, K Warren, CJ Bolland, Armand, Reach & Spin, Teebone, MC Kie & MC Sparks, Top Cat, Future Underground Nation, Antonio, Zed Bias, Ramsey & Fen, Lyndsey Moore, Sia, Exemen, Roy Davis Jr. and Peven Everett, Kelly G., Indo, Bump 'N' Flex, Anita Kelsey, Deetah, Bizzi, Booker T, Danny J Lewis, H Man, NuBirth, Tuff & Jam, TJR, Xavier, Ladycop, Jaheim, Dub-A-Holics Roller, Wookie, Fabulous Baker Boys, Romina Johnson, Scott & Leon, Amar, Christian Falk & Demetreus, Glamma Kid, 3rd Core, Hardrive, George Morel, Janet Rushmore, MK, Mood II Swing, Carol Sylvan, Black Magic, MD X-spress, Nightcrawlers, Kim English, Armand Van Helden, Boris Dlugosch Presents Booom, Julian Jonah, Lash Larou, Timo Maas, Cleptomaniacs, Lonyo, Wideboys, Dennis G., DJ Oxide, and Pay As You Go Cartel. The House & Garage Orchestra is the creation of old-school UK garage (UKG) producer DJ Shy Cookie and long-term friend/co-producer Ishmael Hamilton and is the original live touring and recording house and garage focused project. Garage Classics is the first album from this exciting live outfit and brings together 18 of the biggest UKG hits of the late '90s/early '00s, brought back to life in a unique live band with orchestra style. Garage Classics features a stellar line-up of original UKG artists and new talent, all re-interpreting their own and others' anthems accompanied by a live band and orchestra. With artists including Sweet Female Attitude, Kele Le Roc, Denzee (Monsterboy), Shola Ama, MC Neat, Shelley Nelson, BB Diamond, Shy Cookie himself and newcomers Kayla Amor, Camden Cox, Oggie, Freejak & Safety First, Tough Love, and Reigns, the album has real nostalgia and heritage alongside fresh faces. Massive house and UKG hits re-interpreted on the album include "Movin' Too Fast" (Artful Dodger), "Flowers" (Sweet Female Attitude), "Sorry" (Monsterboy), "My Love" (Kele Le Roc), "Sincere" (MJ Cole), "Little Bit Of Luck" (DJ Luck & MC Neat), "Romeo" (Basement Jaxx), "Closer Than Close" (Rosie Gaines), "Straight From The Heart" (Doolally), "Something In Your Eyes" (Ed Case), "Imagine" (Shola Ama), "Gypsy Woman" (Crystal Waters) and "Hideaway" (De'Lacy). To these are added two exclusive new tracks, "Let Me Show You How" and "Change The World" from Shy Cookie, already causing waves at specialist radio plus two massive UKG remix-covers of classic tracks "Masterblaster" (Stevie Wonder) and "Poison" (Bel Biv Devoe). Garage Classics is aimed squarely at the 25-34 & 35-44 lapsed clubber/coffee table demographic who remember the heady days of UKG from the late '90s and early '00s but are looking for a fresh, maybe more sedate but still-exciting take on their favorite anthems. Digipak in matte finish with foil blocking. 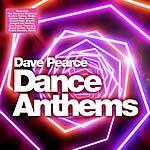 Following up Dave Pearce's Trance Anthems (2018) and 2015's 90s Dance Anthems (35k), the BBC Radio 1 legend returns with his latest selection, Dance Anthems. The creator and original presenter of BBC Radio 1's Dance Anthems, Pearce has been a driving force in the UK dance scene for many years. Dave has sold over 1.5 million mix compilation albums in the UK with multiple top five UK Chart positions, a true superstar of dance. Spanning the halcyon days of '90s & '00s dance, Dance Anthems is an unrivalled selection, packed with the biggest classics and hidden gems from a golden era of dance music. Dance Anthems is a triple cd, 60 track, blast from the past mixing '90s and '00s classics from The Chemical Brothers, David Guetta, Fatboy Slim, Tiësto, Tomcraft, Armand van Helden, Stonebridge, Zombie Nation, Gala, Axwell, De'Lacy, Darude, Modjo, Eric Prydz, and loads more dance classics. Including four official chart number one smashes, 20 top five hits and 44 top 20s, all the tracks on this album are certified classic Dance Anthems. Dance Anthems is the perfect nostalgia ride and the ultimate retro dance-themed gifting album for Christmas 2018. Also features: David Morales Presents The Face, Alex Gaudino, Planet Funk, Kurtis Mantronik Presents Chamonix, Bob Sinclar, M&S Presents The Girl Next Door, Cevin Fisher's Big Freak, Mighty Dub Katz, Masters At Work, Static Revenger, Silicone Soul, Dirty Vegas, Tina Moore, Sweet Female Attitude, Corona, Plummet, D:Ream, Degrees Of Motion, Bob Marley vs Funkstar de Luxe, Moloko, Tom Novy, Chocolate Puma, Shakedown, K-Klass, Chicane, Dario G, Sound De-Zign, Awesome 3, Atlantic Ocean, Divine Inspiration, Lasgo, OT Quartet, Ferry Corsten, Members Of Mayday, Dogzilla, Grace, Agnelli and Nelson, Paul Oakenfold, Lightforce, Dirt Devils, Tony De Vit, Vincent de Moor, Lange, Warrior, Lock 'N' Load, Cosmic Gate, Safri Duo, and Public Domain. New State Music's Innovation - Drum & Bass Anthems brings together sixty-plus tracks from the cream of the current drum & bass world plus classic anthems across three CDs. Award-winning drum & bass brand Innovation have been running events since 1995 and are the UK's largest drum & bass event organizers, with regular events across the UK including Innovation As We Ever and 16+ events New Bass Generation. Add in the world's biggest drum & bass festival Innovation In The Dam in Amsterdam along-side multi award winning Innovation In The Sun in Spain, Innovation have got the world of drum & bass covered. If you are a fan of drum & bass chances are you've been to an Innovation event! 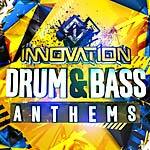 Innovation - Drum & Bass Anthems is this year's biggest drum & bass album showcasing the real sound of drum & bass. Headline artists include The Prodigy, Wilkinson & Sub Focus, Sigma, DJ Fresh, Pendulum, Chase & Status, Danny Byrd, Macky Gee, DJ Guv, Drumsound & Bassline Smith, DC Breaks, High Contrast, Fatboy Slim, Origin Unknown, Krome & Time, Q Project, Marvellous Cain, Cutty Ranks, and loads more of the biggest drum & bass rollers ever. Features: Kanine, Dimension, DJ Limited, Tyke, Daddy Earl, Emperor, Serum, Voltage, Majistrate, Rowney, Murdock, Modified Motion, Faction,Cyantific, TC, Benny L & Shimon, Upgrade, Jaydan, Bad Company UK, Kings Of The Rollers, Friction, JP Cooper, DJ Ollie, 1991, Inja, Nazca Linez, Supreme Being, Sigma, Levela, Annix, DJ Hype, Eksman, Social Misfits, Ego Trippin, Mob Tactics, Delta Heavy, DJ Rap, DJ Nut Nut, KG, Top Cat, Total Science, Break, S.P.Y, London's Most Wanted, Distract, Bladerunner, Cabbie, Sub Zero, DJ Limited Spyda, Benny V, K-Warren, Undercover Agent, and Rufige Kru. Since the release of Pure Garage (2000), Pure are now firmly established as the No.1 urban dance music compilation pioneers. Now Pure is back with another bassline installment; Pure Bassline Anthems, backed with a nationwide club tour and mixed by two of the biggest names in the bassline scene, original bassline heroes, DJ Q and Jamie Duggan. With its original roots in the UK North & Midlands, the bassline sound has rapidly spread nationwide, and is now the UK's hottest sound, taking clubs by storm. DJ Q is at the forefront of the bassline & UKG scene, as one of its leading DJs and producers with remix credits including Dizzy Rascal, H20, Katy B, Rusko, Toddla T, Shola Ama, and Boy Better Know. As well as extensively touring, DJ Q is also the 'Q' in bassline supergroup TQD. Jamie Duggan was resident of Sheffield's famous Niche club and is synonymous with the bassline scene. He previously mixed Ministry of Sound's series The Sound of Bassline (2008, 2009). Jamie has also remixed some of music's biggest names, including Rihanna, Skepta, Boy Better Know, and Wiley. Jamie has performed at world-wide venues including London's 02 Arena, Ministry of Sound, Eden Ibiza and many more. 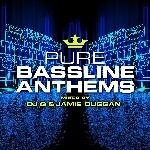 Pure Bassline Anthems is a triple disc, 60 track mix. Discs one and two focus on the latest upfront anthems, while disc three sees DJ Q and Jamie Duggan go back-to-back with a classic bassline anthems mix. The album contains exclusives and bassline remixes of T2, Sweet Female Attitude, Blazin' Squad, Nathan Dawe, DJ Q, TQD, and Flava D, plus many VIP mixes made especially for the album. Also features: Francois and Louis Benton x Riddim Commission, Sammy Virji, Shaun Dean, Wheeto, Nomey x Jack Junior, Freddo, Robbie Rue x Jack Junior, Sharda and Shanique, Zibba, Champion, Zero, JG x Corey x Young Artz, Jamie Duggan and Booda, AC Slater, Chris Lorenzo, Taiki Nulight, Francois and Louis Benton, Carmada, Corrupt, Bass Boy, Bru-C and P Money, Skue-K, Ts7, Cajama, TC, Darkzy, Hot Goods, Livsey, Thorpey x Forca, NLMT, Rachel M, T2, Dexplicit, Paleface, Lauren Mason, FB, MC Bonez, DJ Pantha, Nastee Boi, TRC, Delinquent, Alex Mills, Danny Dubz, and Platnum. Kinobe scored one of the biggest chill-out club hits of the 2000s, the deathless "Slip Into Something More Comfortable". Known from dance floors, club backrooms, bars, radio spins, Café del Mar compilations and TV spots the world over (most famously the "femme fatale Kronenbourg beer advert), "Slip..." established the duo at the forefront of a scene that includes Groove Armada, Air, Röyksopp and Zero 7. Now Kinobe are back in a big way; founding member and songwriter Julius Waters is joined by Chuck Norman, multi-instrumentalist, producer and programmer who has worked with the Pet Shop Boys, Peter Gabriel, and Robbie Williams. Norman has beefed up the classic Kinobe sound, while adding a pop sensibility to a raft of sparkling new material destined to soundtrack 2018 and beyond on Golden Age, the first Kinobe album in nine years. Lead single "Little Words" might just be one of the tunes of year, a Donny Hathaway-esque, soulful slice of too-slow-to-disco that nods towards '60s hipster grooves. At once instantly familiar and brand-new, the single is a heartfelt three-and-a-half-minute pop-dance floor-filler with a hook that once heard is never forgotten. Elsewhere the Stephen Hague-mixed "End Of The Road" is a huge gospel-tinged ballad destined to own daytime radio, "Skyhigh", is a gorgeously haunting sundowner, "Heartstring" is all cosmic soundtrack strings while "Sunray" is Kinobe at their very best, with its irresistible hooks, washes of melody and down-tempo beats. Golden Age is shaping up to be the chilled album of the year, a thirteen-track soundscape of sparkling songs and idiosyncratic instrumentals that is vintage Kinobe. Welcome to the Golden Age. 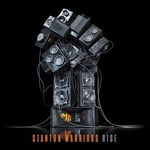 CD version includes a second disc with all tracks as a continuous mix. Naughty Sesh is the hottest new brand taking club-land by storm, producing stand-out and unforgettable events for UK clubbers with a series of instantly sold-out raves. Headed up by Kiss FM's hugely popular DJ, Majestic, alongside infamous UK comedian, viral superstar and Big Brother inmate Dapper Laughs, together they now present, Naughty Sesh Weekend Anthems. The album is a heady mix of party bangers from the biggest house, garage, drum & bass anthems through to old school gems and club classics, all mixed and curated by the multi-talented Majestic. Sesh culture is a uniquely British phenomenon that has seen a surge in popularity across the UK and is now the UK's number one online buzz word to describe all pre-party fun and post-party madness. For everyone from ravers, to festival fans, when hedonistic fun is a way of life, and the night should last forever, then get on the Sesh! Naughty Sesh Weekend Anthems features three bumper CDs packed full of proper sesh anthems, from club classics to current smashes, all helping you get in the zone for the waviest weekend! Naughty Sesh Weekend Anthems features the biggest and best artists with tracks from Calvin Harris, Stormzy, MK, Disciples, Craig David, The Prodigy, Baby D, Camelphat, Duke Dumont, Gorgon City, Wiley, Chase and Status, DJ Luck and MC Neat, Lethal Bizzle, Skepta, Tom Zanetti, and loads more. Also features: Majestic & Tigermonkey, The Manor, James Hype, Tough Love, Friend Within, Krystal Klear, Mella Dee, Weiss, Wankelmut & Emma Louise, DJ S.K.T, Nasser Baker, Gatsby, Like Son, Dapper Dan, D Double E, The Streets, DJ Pied Piper & The Masters Of Ceremonies, Daniel Bedingfield, Scott Garcia, Sweet Female Attitude, Genius Cru, So Solid Crew, Liquid, M‐Beat, Origin Unknown, Devilman, SASASAS, DJ Hazard & D Minds, Drumsound & Bassline Smith, Sigma, Rudimental, Hot Natured, Disciples, Elderbrook, Infinity Ink, Storm Queen, The Shapeshifters, Madison Avenue, Gala, Perfecto Allstarz & Freejak, Ryan Blyth & After 6,Degrees Of Motion, T2, Vato Gonzalez, Donae'O, Example, Sunset Bros X Mark McCabe, and Chicane. Double LP. Includes CD. Kinobe scored one of the biggest chill-out club hits of the 2000s, the deathless "Slip Into Something More Comfortable". Known from dance floors, club backrooms, bars, radio spins, Café del Mar compilations and TV spots the world over (most famously the "femme fatale Kronenbourg beer advert), "Slip..." established the duo at the forefront of a scene that includes Groove Armada, Air, Röyksopp and Zero 7. Now Kinobe are back in a big way; founding member and songwriter Julius Waters is joined by Chuck Norman, multi-instrumentalist, producer and programmer who has worked with the Pet Shop Boys, Peter Gabriel, and Robbie Williams. Norman has beefed up the classic Kinobe sound, while adding a pop sensibility to a raft of sparkling new material destined to soundtrack 2018 and beyond on Golden Age, the first Kinobe album in nine years. Lead single "Little Words" might just be one of the tunes of year, a Donny Hathaway-esque, soulful slice of too-slow-to-disco that nods towards '60s hipster grooves. At once instantly familiar and brand-new, the single is a heartfelt three-and-a-half-minute pop-dance floor-filler with a hook that once heard is never forgotten. 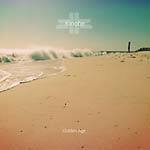 Elsewhere the Stephen Hague-mixed "End Of The Road" is a huge gospel-tinged ballad destined to own daytime radio, "Skyhigh", is a gorgeously haunting sundowner, "Heartstring" is all cosmic soundtrack strings while "Sunray" is Kinobe at their very best, with its irresistible hooks, washes of melody and down-tempo beats. Golden Age is shaping up to be the chilled album of the year, a thirteen-track soundscape of sparkling songs and idiosyncratic instrumentals that is vintage Kinobe. Welcome to the Golden Age. "Twenty-five years ago the idea that a club brand would be known around the world, embodied in a simple but instantly recognized logo would have been laughed at. 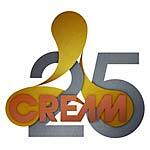 But today Cream is unrivalled as a leading emblem in creating unique clubbing atmospheres for millions of people. Cream has global recognition for doing one thing -- making memories that live with you forever." --Nick Stevenson, Mixmag) Cream 25 aims to bring those memories flooding back with this collection of the biggest Cream classics from 1992-2017 over three CDs. Impeccably selected by the Cream team and Cream resident DJs, past and present, the Cream 25 tracklist reflects Cream's unique approach to electronic music and their ability to blend genre defining highlights with more tantric moments of pure dancefloor genius, bringing the bold and brazen together with the cool and collected. From 1992's Degrees of Motion's Do You Want It Right Now, through to Disciples' On My Mind (2017), Cream 25 will bring back those Cream emotions. The album contains nine #1s: The Shapeshifters' "Lola's Theme", Roger Sanchez's "Another Chance", Modjo's "Lady", David Guetta's "Titanium" featuring Sia, Storm Queen's "Look Right Through", Calvin Harris's "I'm Not Alone", Tomcraft's "Loneliness", Oliver Heldens and Becky Hill's "Gecko", Madison Avenue's "Don't Call Me Baby", plus another 18 Top 10s. From the piano stabs of Swedish House Mafia, Calvin Harris, and D:Ream, the hooky basslines of Camisra and Robin S, the French filtered house of Modjo, the epic trance workouts of Tiësto, Binary Finary, and Oakenfold, the big room of Avicii and Galantis, the electro house of Mason and Bodyrox through to the deeper house of Storm Queen and Disciples, all of these tracks are Cream anthems. Also features Tori Amos, Armand Van Helden, De'Lacy, Dubfire, Ryan Blyth X After 6, Malisha Bleau, Eric Prydz, Disclosure, Gregory Porter, MK,OFFAIAH, Denney & Mekon, Roxanne Shante, Freejak & Safety First, BB Diamond,Eelke Kleijn, Therese, deadmau5 & Kaskade, Cosmos, Layo & Bushwacka!, Axwell, Diplo, Faithless, Paul Van Dyk, DJ Tiesto, Energy 52. Three N One,Atlantic Ocean, BT, Vincent Covello, Oakenfold & Osborne, Tall Paul, Benny Benassi Presents "The Biz", Lucianna, D. Ramirez, Royksopp, Thin White Duke,Gala, K-Klass, Happy Clappers, Gusto, Madison Avenue, Kenny "Dope" Presents The Bucketheads, The Original, Dancing Divaz, Paul Johnson, Sandy B, Do You Want it Right Now (King Street Mix), Dusky, Above & Beyond, Zoe Johnston, Dirty Vegas, Kölsch, Zero 7, Photek, and The Beloved.